Andrew Novick is one of Casa Bonita's biggest fans. We sat down with him to learn about some of his favorite parts of the iconic restaurant. LAKEWOOD, Colo. — Andrew Novick has a mission: Spread the word of the epic greatness that is one of the Denver area's most iconic restaurants. Novick, a Denver resident and longtime staple in the local arts community, has been dining at Casa Bonita every year since it opened, 1974. He recently celebrated his 300th visit. We sat down with Novick to learn what he loves most about the restaurant and what makes it "300-visit" special. 9NEWS: How long have you been going to Casa Bonita? Novick: I started going in 1974, the year it opened! I was 5 years old! Chile Rellenos - I usually alternate between that and chicken deluxe, because I love the cheese enchiladas! I got to design my own meal for the event yesterday - the Andrew Deluxe, which has a chile relleno AND cheese enchiladas! Do you have a favorite attraction at Casa Bonita? Are there any special rooms or features at Casa Bonita that most people don’t know about? Most people don't know about the Bullfighter Room. It's in the far top corner, a quarter mile from the kitchen! The concave ceiling Pink Palace room creates very interesting audio wave propagation -- you can hear someone whispering from across the room. Casa Bonita has a lot of history. What are some fun facts you know about the restaurant? Sometimes they make 10,000 sopaipillas in a day! The fountain and pool system contains 50,000 gallons of water. What's the scariest part of Black Bart’s hideout? The buzzing skull still scares me every time! 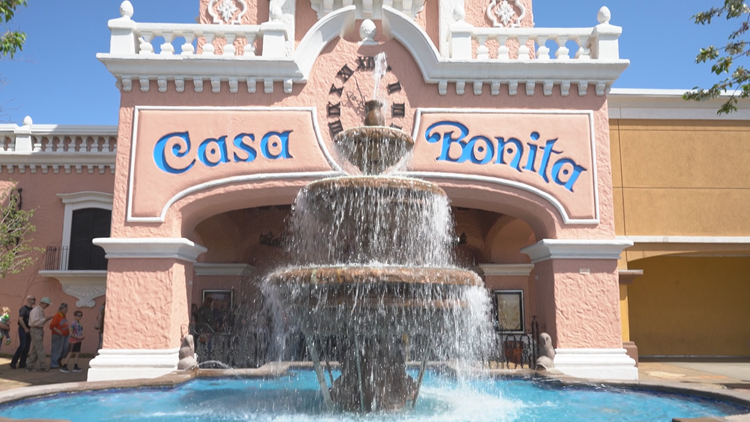 What’s your favorite Casa Bonita memory? I was with a group from the Denver Modernism Show and they wanted a tour, so I showed them all around the restaurant and relayed many facts and non-facts -- people loved it, so I just kept going! Now, other people do my tour too...and a friend even did it in French! I hope it can be presented in several languages! Do you think you’ll make it to 400 visits? By all means, but it will be a while. My recent average is 8 to 10 times per year. I hit the 200 mark in 2006, so it could be many years before 400! Finally, you must’ve eaten a lot of sopaipillas over the years. What’s the estimate? I love the sopaipillas! I would imagine I have eaten almost 1,000!